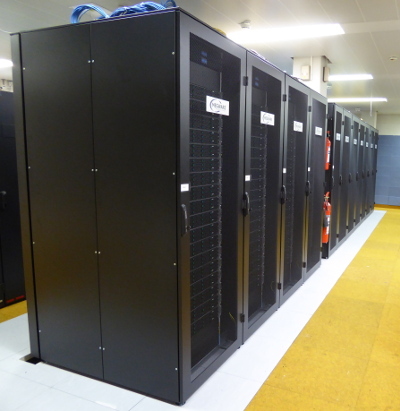 The RRZE’s Meggie cluster (manufacturer: Megware) is a high-performance compute resource with high speed interconnect. It is intended for distributed-memory (MPI) or hybrid parallel programs with medium to high communication requirements. 728 compute nodes, each with two Intel Xeon E5-2630v4 „Broadwell“ chips (10 cores per chip + SMT) running at 2.2 GHz with 25 MB Shared Cache per chip and 64 GB of RAM. 2 front end nodes with the same CPUs as the compute nodes but 128 GB of RAM..
Lustre-based parallel filesystem with a capacity of almost 1 PB and an aggregated parallel I/O bandwidth of > 9000 MB/s. Intel OmniPath interconnect with up to 100 GBit/s bandwidth per link and direction. Measured LINPACK performance of ~481 TFlop/s. The name „meggie“ is a play with the name of the manufacturer. Meggie is a system that is designed for running parallel programs using significantly more than one node. Jobs with less than one node are not supported by RRZE and are subject to be killed without notice. Note that access to Meggie is still restricted: If you want access to it, you will need to contact hpc@rrze and provide a short (!) description of what you want to do there. If your internet connection supports IPv6, you can directly ssh to the front ends (but not to the compute nodes). Otherwise, if you need access from outside of FAU, you usually have to connect for example to the dialog server cshpc.rrze.fau.de first and then ssh to meggie from there. While it is possible to ssh directly to a compute node, a user is only allowed to do this while they have a batch job running there. When all batch jobs of a user on a node have ended, all of their processes, including any open shells, will be killed automatically. The login and compute nodes run CentOS (which is basically Redhat Enterprise without the support). As on most other RRZE HPC systems, a modules environment is provided to facilitate access to software packages. Type „module avail“ to get a list of available packages. The shell for all users on Meggie is always bash. This is different from our other clusters and the rest of RRZE, where the shell used to be tcsh unless you had requested it to be changed. The following table summarizes the available file systems and their features. It is only an excerpt from the description of the HPC file system. The nodes do not have any local hard disc drives like on previous clusters. When connecting to one of the front end nodes, you’ll find yourself in your regular RRZE $HOME directory (/home/hpc/...). There are relatively tight quotas there, so it will most probably be too small for the inputs/outputs of your jobs. It however does offer a lot of nice features, like fine grained snapshots, so use it for „important“ stuff, e.g. your job scripts, or the source code of the program you’re working on. See the HPC file system page for a more detailed description of the features. The cluster’s parallel file system is mounted on all nodes under /lxfs/$GROUP/$USER/ and available via the $FASTTMP environment variable. It supports parallel I/O using the MPI-I/O functions and can be accessed with an aggregate bandwidth of >9000 MBytes/sec (and even much larger if caching effects can be used). The parallel file system is strictly intended to be a high-performance short-term storage, so a high watermark deletion algorithm is employed: When the filling of the file system exceeds a certain limit (e.g. 80%), files will be deleted starting with the oldest and largest files until a filling of less than 60% is reached. Be aware that the normal tar -x command preserves the modification time of the original file instead of the time when the archive is unpacked. So unpacked files may become one of the first candidates for deletion. Use tar -mx or touch in combination with find to work around this. Be aware that the exact time of deletion is unpredictable. Note that parallel filesystems generally are not made for handling large amounts of small files. This is by design: Parallel filesystems achieve their amazing speed by writing to multiple different servers at the same time. However, they do that in blocks, in our case 1 MB. That means that for a file that is smaller than 1 MB, only one server will ever be used, so the parallel filesystem can never be faster than a traditional NFS server – on the contrary: due to larger overhead, it will generally be slower. They can only show their strengths with files that are at least a few megabytes in size, and excel if very large files are written by many nodes simultaneous (e.g. checkpointing). For that reason, we have set a limit on the number of files you can store there. As with all production clusters at RRZE, resources are controlled through a batch system. The front ends can be used for compiling and very short serial test runs, but everything else has to go through the batch system to the cluster. Meggie is RRZE’s first cluster to use SLURM as a batch system! For users of our older torque-based clusters, this means that the batch system commands have changed significantly. big 0 – 24:00:00 1 – 256 special users Not active all the time as it causes quite some waste. can really make use of more than 64 nodes with their codes. There is no routing queue! If you want to take advantage of the reserved nodes in the devel partition, you have to explicitly specify this in your job script via --partition=devel. As on all RRZE clusters, Intel MPI is recommended, but OpenMPI is available, too. Due to the SLURM scheduling system, two different ways to start your MPI application are possible. Like on emmy, you can use the native tools of the selected MPI as described here, i.e. calling mpirun. Alternatively, you can also use the generic SLURM way by calling srun with the option--mpi=pmi2. Both startup mechanisms are able to get parameters like number of nodes or processes per node directly from the SLURM scheduler, i.e. the parameters that you specified in the header of your job script. This means that you don’t have to necessarily specify any parameters for mpirun/srun. However if you do, you should keep them consistent to avoid unpredictable behavior. Intels ark lists some technical details about the Xeon E5-2630v4 processor. Omni-Path is essentially Intels proprietary implementation of „Infiniband“, after they acquired the Infiniband-part of QLogic. It shares most of the features and shortcomings of QLogic-based Infiniband networks. Each node in Meggie has a 100 GBit Omni-Path-card, and is connected to a 100 GBit switch. However, the backbone of the network is not fully non-blocking: On each leaf-switch, 32 of the 48 ports are used for compute nodes, and 16 ports are used for the uplink, meaning there is a 1:2 blocking on the backbone. As a result, if the nodes of your jobs are not all connected to the same switch, you may notice significant performance fluctuations due to the oversubscribed network. The batch system tries to run jobs on the same leaf switch if possible, but for obvious reasons that is not always possible, and for jobs utilizing more than 32 nodes is straight out impossible. Compared to the Mellanox-IB-cards in our other clusters, you will also notice that the Omni-Path stack is a horrible CPU-hog. It can easily steal two whole CPUs, so if your job communicates a lot, it might be helpful to not use all cores of a node.